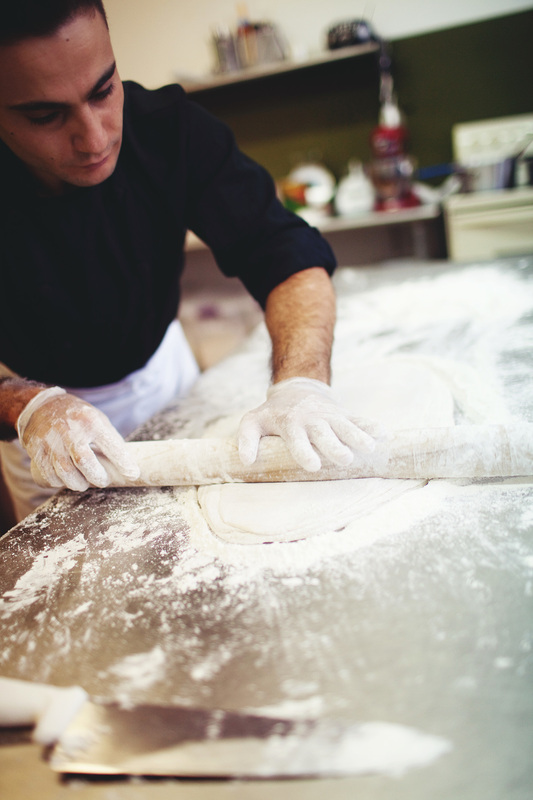 Sweet-Maker, Ahmad Aissa, hand-rolling our signature vegan fillo dough. 100% Natural Vegan Ingredients - Green pistachios, unbleached hard wheat flour (malted barley, niacin, reduced iron, thiamine mononitrate, riboflavin, folic acid), sugar, water, organic virgin coconut oil, sunflower oil , corn starch, orange blossom water, salt, and citric acid. Contains: Wheat and Tree Nuts. Made in a facility that uses peanuts, milk, eggs, and soy. 100% Natural Vegan Ingredients - Unbleached hard wheat flour (malted barley, niacin, reduced iron, thiamine mononitrate, riboflavin, folic acid), cranberries, cashews, sugar, water, organic virgin coconut oil, sunflower oil, corn starch, orange blossom water, cornmeal, salt, and citric acid. 100% Natural Vegan Ingredients - Unbleached hard wheat flour (malted barley, niacin, reduced iron, thiamine mononitrate, riboflavin, folic acid), organic Turkish apricots, cashews, sugar, water, organic virgin coconut oil, sunflower oil, corn starch, orange blossom water, cornmeal, salt, and citric acid. 100% Natural Vegan Ingredients -Unbleached hard wheat flour (malted barley, niacin, reduced iron, thiamine mononitrate, riboflavin, folic acid), sunflower oil, organic virgin coconut oil, dates, sugar, water, orange blossom water, powdered sugar, and yeast. 100% Natural Vegan Ingredients -Unbleached hard wheat flour (malted barley, niacin, reduced iron, thiamine mononitrate, riboflavin, folic acid), sunflower oil, organic virgin coconut oil, carrots, sugar, water, cinnamon, yeast, citric acid. Contains: Wheat. Made in a facility that uses tree nuts, peanuts, milk, eggs, and soy. 100% Natural Vegan Ingredients - Unbleached hard wheat flour (malted barley, niacin, reduced iron, thiamine mononitrate, riboflavin, folic acid), sunflower oil, organic virgin coconut oil, walnuts, coconuts, sugar, water, orange blossom water, yeast, citric acid. Storage : Aissa Sweets should be stored in a cool, dry place. When kept in an airtight container, they last for weeks, and even longer if kept refrigerated.